Benjamin has been considered a professional sculptor since age 14 and has since blossomed into an internationally-known alabaster stone carver. His works range from small crafts to grand religious and nature-themed statues. 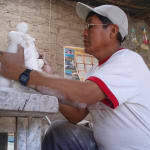 Don and Alessandra visited the Pizzaro family's stone carving workshop in Ayacucho, Peru in April right before Easter 2017. Benjamin and Bertina make all the normal alabaster nativities in our wholesale collection, so we were excited to have this rare opportunity to visit.